Riverside at Royal Albert Wharf is a new thriving riverside district in East London, with easy transport connections to the rest of the city. Already being enjoyed by so many, Riverside offers a selection of uniquely designed, high quality 1,2 and 3 bedroom apartments, most with views of the Thames. Royal Albert Wharf has become its own destination. It is well connected for travel within London and abroad. Perfect for commuters and travellers. It takes approximately 3 minutes to walk to the Gallions Reach DLR station from the Riverside development, which connects you to Canning Town in 11 minutes. From Canning Town it takes a further 10 minutes to reach Zone 1. There is also Gallions Reach Shopping Park within a 15 minute walk, or 5 minute drive. 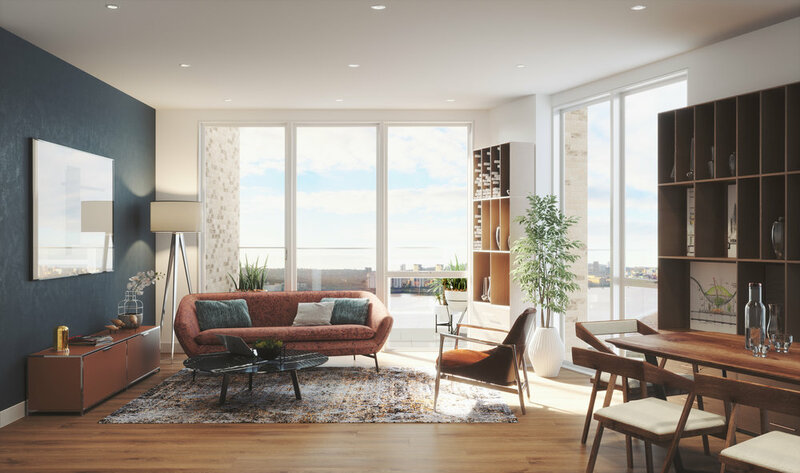 Please fill out this short form if you are interested in finding out more about Riverside at Royal Albert Wharf or call our agents on 0203 627 4988. Come and visit us at 8-9 Upper Dock Walk, E16 2GU (sat nav postcode E16 2QJ). We are open Tuesday - Friday, 11am - 7pm and Saturday 11am - 5pm. By agreeing to our terms and conditions you accept that Notting Hill Genesis will retain and process your data for the purpose of marketing Riverside at Royal Albert Wharf. We will also pass your data on to our estate agents, Savills, who will contact you about your enquiry. * Terms and conditions apply, contact our team for details. Stamp Duty saving illustrated is maximum saving and based on buying 56 Hamme Building, 25 Shackleton Way, E16 2XJ at a full market value of £787,500. Actual Stamp Duty Land Tax saving will depend on individual circumstances and plot value/purchased. Stamp Duty Land Tax (SDLT) paid only applies when the purchaser offers at full marketing price - no further discounts will be accepted. Offer only available to owner occupiers. Other T&C’s apply, speak to a member of our sales team for further details. Offer applies to reservations made on/between 19/11/18 – 28/02/19. Sale must exchange within the agreed timescales. If this is not met we reserve the right to withdraw the sale. Offer may be removed or changed at any time.